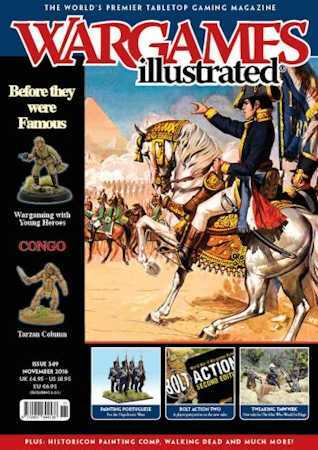 Our theme this month is Before they were Famous, and we feature five articles focusing on wargaming with famous historical commanders, before they were famous! George Washington, Robert E Lee, Churchill, and Rommel, all make an appearance among our theme content. Our lead article considers the draw of using future ‘big names’ in our games and how we can aim to replicate their developing skills on the tabletop. The first of a three part series on the Great Northern War. Barry Hilton presents a useful primer and an account of his first foray into this fascinating conflict. George Washington’s first armed action, fought whilst representing the very foreign power he would one day help to vanquish. The Flames Of War Team presents information on the Tiger tank, following the new plastic kit released for their World War Two range this month. service history that helped to shape some of the most celebrated commanders in US history? We take a look at a game that matches the world of the comic book to the tabletop and see how the transition from one medium to another works out. THEME: YI! YI! BANG! BANG! Pete Brown looks at the early military career of Winston Churchill and the action in the Mahmund Valley, September 1897. THEME: ROMMEL – LIEUTENANT WHO? Jerry Richardson looks at wargaming the First World War activities of a future German Field Marshal during some of his earliest combat experiences. We present for your gaming delight, straight from the plot of The Legend of Tarzan movie, a totally unofficial optional ‘Column’ for use with Studio Tomahawk’s excellent Congo rules. FIGHTING TALK: IN HEAVEN WITHOUT HAVING TO DIE FIRST! Barry Hilton reflects upon his time ‘well spent’ at the Historicon convention. Kenneth James, a Bolt Action veteran, analyses the new second edition of the rules and provides a personalized response to the changes. The Second Battle of St. Albans, 1461 was a game featured at the Partizan show this year. Following on from his article on constructing suitable buildings (in WI346), Nick Buxey tells us more about the game. The trials and tribulations of researching and painting Napoleonic Portuguese line infantry, in this case using Warlord Games plastic figures. Our annual round up of the painting comp winners in this WI sponsored contest. Author Dan Mersey presents some additional rules for use with The Men Who Would Be Kings from Osprey Games. Rob Wubbenhorst introduces us to his Texan gaming club with a very British looking home, the local pub.